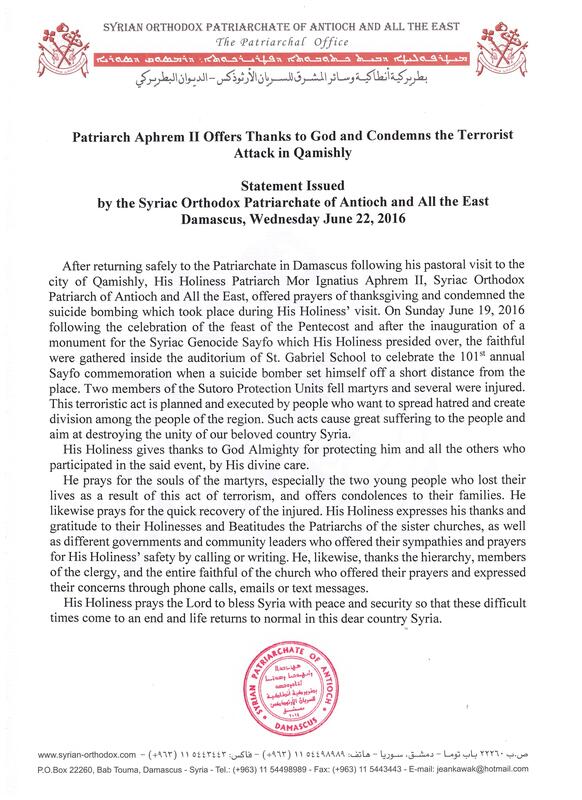 On Sunday June 19, 2016 following the celebration of the feast of the Pentecost and after the inauguration of a monument for the Syriac Genocide Sayfo which His Holiness presided over, the faithful were gathered inside the auditorium of St. Gabriel School to celebrate the 101st annual Sayfo commemoration when a suicide bomber set himself off a short distance from the place. Two members of the Sutoro Protection Units fell martyrs and several were injured. This terroristic act is planned and executed by people who want to spread hatred and create division among the people of the region. Such acts cause great suffering to the people and aim at destroying the unity of our beloved country Syria. His Holiness gives thanks to God Almighty for protecting him and all the others who participated in the said event, by His divine care. He prays for the souls of the martyrs, especially the two young people who lost their lives as a result of this act of terrorism, and offers condolences to their families. He likewise prays for the quick recovery of the injured. His Holiness expresses his thanks and gratitude to their Holinesses and Beatitudes the Patriarchs of the sister churches, as well as different governments and community leaders who offered their sympathies and prayers for His Holiness’ safety by calling or writing. He, likewise, thanks the hierarchy, members of the clergy, and the entire faithful of the church who offered their prayers and expressed their concerns through phone calls, emails or text messages. His Holiness prays the Lord to bless Syria with peace and security so that these difficult times come to an end and life returns to normal in this dear country Syria. This entry was posted in Featured News, News and tagged Gabriel School, God Almighty, His Holiness, Sutoro Protection Units, Syriac Genocide Sayfo by Orthodoxy Cognate PAGE. Bookmark the permalink.